Volunruud is a tomb containing a word wall for the Aura Whisper shout, as well as the treasure and dead body of the Tongue Chieftain Kvenel. It has an exterior and two interior zones, Volunruud and Volunruud Elder's Cairn. This ruin is supposedly the final resting place of one "Tongue Chieftain Kvenel", among others. Replicas of his two weapons are the key to his burial chamber. A man named Heddic, from Heddic's Volunruud notes, attempted to find his tomb, presumably for the treasure and historical significance. He met his untimely end at the hands of the dead who were "living" there. There are several large standing stones to the east of the barrow. An unlocked chest is in an alcove on the left side and to its right is a burial urn. Further to the right are two more burial urns. Climb the side of the barrow and descend the curved stone stairs marked at the top by an unlit candle on a stand. Under the top of the stairs is another unlocked chest and to the right of the entrance in an alcove is another burial urn. Upon entering there are stairs leading down to the north with a landing a few steps down with the skeleton of Heddic laying on the ground. To the left of the skeleton is a throne with a slumbering skeleton sitting in it. It will become aggressive if disturbed, so it is best to kill it in one hit. Beside the first skeleton are three coins, an iron dagger and Heddic's Volunruud notes. Reading these will initiate the quest Silenced Tongues. Following the stairs down, past an ancient Nord battle axe you come to a room with four exits to the northeast, north, northwest and southwest. Around the room there is rubble, an empty cart, a pickaxe, various bones both human and animal and a lit brazier to the east behind a rock pillar. In front of the exit to the southwest there is an iron ore vein on the floor. Ignore the path up the stairs to the north for now. Through the exit to the southwest is a short corridor with steps leading down into a room full of plants, where a wooden door exits to the northwest. 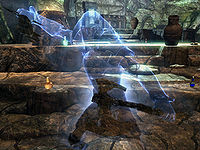 If you are here during the quest The Silence Has Been Broken, six draugr will be laying on the floor, three of which are leveled, and through the door is Amaund Motierre and his bodyguard Rexus. Otherwise no one will be present. Also in the room is a large urn against the west wall, a chest against the wall to the northwest with a bed roll, an eidar cheese wheel, and a loaf of bread in front of it. To the north-northeast is an alcove where Amaund obviously completed the Black Sacrament. There is a human heart and flesh, a nightshade flower, an iron dagger, and a copy of A Kiss, Sweet Mother along with a skeleton covered in blood. Head back to the main room, this time taking the exit to the northwest. Proceed down a short corridor to an unlocked iron door. Opening the door will reveal a crypt area with alcoves along the walls for the dead. 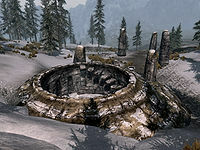 From your left following the wall around, the second and fourth alcoves contain draugr that will arise if they detect you. Above the second draugr there is some hanging moss growing from above, and to the right are stairs leading down to the northeast. At the bottom of the stairs there are alcoves on your right. There is a slumbering draugr in the second alcove. There is a doorway opposite with a path that heads down an earthen ramp to the north-northeast before turning back on itself. There are a couple of draugr patrolling up and down. The second of the draugr is a magic user. Once they have been dealt with proceed down. After the switchback there is an iron ore vein on the left on the wall. At the bottom there is an unlocked iron door to the northwest. Through the iron door is a small room with a throne against the north wall with a leveled draugr sitting in it. To its right is an open upright sarcophagus with another leveled draugr. As soon as you enter the room the standing draugr will awaken and start looking for you. As soon as you attack, the draugr on the throne will rise and join the fight. There are seven pressure plates that have short spikes that come up from the center of them to cause minor damage scattered around the room. In the western corner of the room and to the northwest are two short caved-in areas with nothing of interest. At the rear of the room are many lit candles on stands. On the left arm of the throne is a copy of the One-handed skill book Mace Etiquette, and above the throne is a ceremonial axe, one of the two replicas of the weapons carried by Kvenel the Tongue that are needed to unlock the door to the Elder's Cairn. Return to the main room the way you came. The path to the northeast twists and turns and leads to a multi-leveled room. You enter the room onto a balcony area directly opposite another balcony that has two draugr standing on it. In front of you is a wooden ramp down to the main room. A stone walkway can be seen overhead. The room below is empty, except for a spike wall trap and pressure plate that activates it just before the corridor to the northwest; there are also bone chimes hanging by this corridor. Avoiding the pressure plate and bone chimes, continue onward, up a short flight of stairs and through an open gate into an area with a lit brazier on your left. Human bones, a pickaxe, and an iron dagger can be found scattered around the floor. There is a corridor to the southeast and one in the northern corner heading back to the southwest. The path to the southwest heads up some stairs and comes out onto the balcony you observed earlier with the two draugr. There are no items of interest here except the draugr you likely killed with ranged weapons from the other side. The path to the southeast turns to the southwest, widens out, and climbs two flights of stairs where you will find a magic-using draugr patrolling up and down. At the top of the stairs the path turns to the northwest and crosses the stone walkway across the main room again. When you reach the other side, you will enter a small catacomb area facing an ancient Nord helmet on a ledge surrounded by candle on stands. A draugr rests in an alcove on your right and will awaken when you enter the room. To the northeast is an unlocked iron door. Through the door you will find a short ramp flanked by two statues that leads up to a platform overlooked by a large stone head. Behind the two statues are upright sarcophagi with a third positioned under the stone head. As you pass the upright sarcophagi, they will open and you will be attacked by draugr. Once they have been dealt with, you can find the ceremonial sword needed to open the Elder's Cairn door resting in the third sarcophagus with the remains of a skeleton. Return to the main area with both ceremonial weapons and head north up the stairs to Elder's Cairn door. Just before the door is a stone table holding a random shield, a salt pile, and a bowl of troll fat. Activating the door places the ceremonial weapons directly into the doors and unlocks access to the Elder's Cairn. The sword is placed on the left and the axe on the right diagonally across the doors. You enter this area at the top of a corridor with a lit brazier on your right and a pickaxe on the floor. Follow the path as it slopes down to the north, passing a burial urn on your left and then a large urn on your right. You will be able to hear the music and noises for a word wall all the way down and along the corridor. Through an arch there is a cave-in on your left; to the right where the path jogs are a burial urn, large urn, a bookcase, and a fireplace with a burnt corpse in front of it. The bookcase holds copies of two random common books, a random potion, an embalming tool, and several ruined books. Underneath the burnt corpse is a scroll of Ice Storm. As you continue along you will see a broken brazier hanging down on your left. Just behind and above this is a stone walkway with a draugr guarding the area. At the end you enter a tunnel that turns to the east. As you approach a lit brazier on the right, a leveled draugr will be alerted and start looking for you. As you pass it the path will open out into a cavern with a throne on the other side to the southeast occupied by the ghostly form of Kvenel. He will attack as soon as you are noticed. There is a boss-leveled chest to the left of the throne on a raised area and to the left of this is a sarcophagus where a magic-using draugr will rise to assist Kvenel. The draugr may summon a frost atronach. Once you have defeated them you may have to search Kvenel twice to get both unique weapons—Eduj a frost damage sword and Okin a frost damage war axe. On the ground on the bottom step of the raised area are two potions, one elixir of true shot and the other a potion of resist magic and further up of the third step a potion of plentiful stamina. To the right of the steps leading up to the throne is a potion of resist fire and on the left arm of his throne is another leveled potion. The boss-leveled chest is unlocked. Inside the sarcophagus to the left of the throne and chest are two potions, one potion of light feet and the other a potion of brief invisibility. There are also two ancient Nord greatswords with an iron warhammer on the ground just in front. The fighting with Kvenel can alert a further draugr to come to his aid from the west. Once the fighting and looting is finished, proceed in this direction. After climbing a few stairs there is a word wall for Aura Whisper on your left and more stairs climbing further to the north. Following these you will pass a burial urn and large urn in the middle of the stairs, at the top the path cross the stone walkway previously seen. In front of you is an unlocked chest, a large urn, three burial urns, an ancient Nord battleaxe, an random shield, a dragon priest dagger, a random helmet, and a copy of A Minor Maze. Once you have looted everything here return to the walkway and face south. Using Whirlwind Sprint you can reach a ledge with another unlocked chest. There is no shortcut or back exit out of Volunruud. 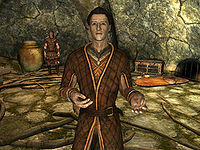 During the Dark Brotherhood quest The Silence Has Been Broken, your map will be updated with the location of Volunruud, as you need to speak to a certain person within the tomb. However, the mission doesn't require you to explore the whole area. During Hail Sithis!, there is an urn full of gold in the room to the left that serves as a reward. It is possible that the spike wall may get stuck on the skeletons connected to the wall. Sometimes the door leading to the Elder's Cairn will not open, even with both ceremonial weapons in your inventory. See Silenced Tongues. ? This page was last modified on 9 April 2018, at 00:57.